Pump Station – Detention Basin: The Sinclair Pump Station (lower left-hand corner of the photo) is shown in September of 2018. The new detention basin sits nearby, safely holding rain water until it drains. 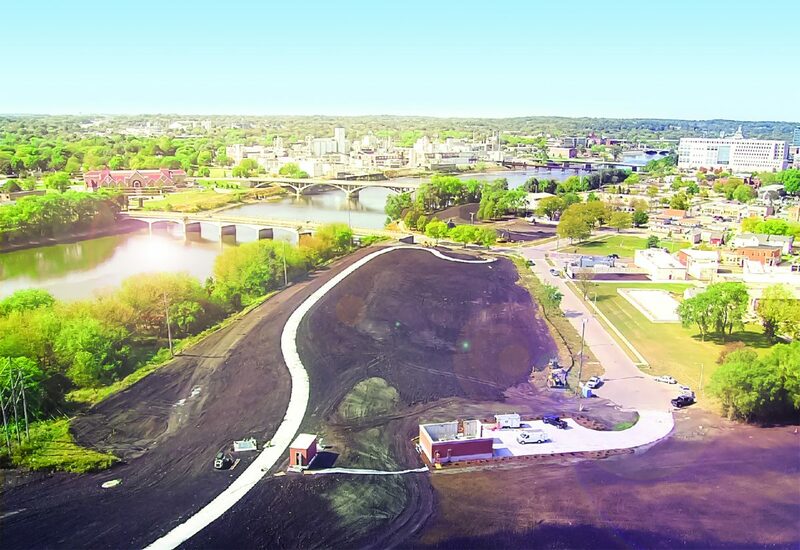 The City of Cedar Rapids’ Cedar River Flood Control System in the New Bohemia/Sinclair District in Iowa is the recent recipient of the Envision Bronze rating for sustainable infrastructure. The Cedar Rapids project is the third Envision award granted to an infrastructure project in the state of Iowa. In 2008, the City of Cedar Rapids suffered a catastrophic flood that crested over 31 feet, 19 feet above flood level. Over 5,300 homes, 900 businesses, and 300 public buildings were damaged. More than 18,000 citizens were directly affected by the flood, and 10,000 were displaced. Total damages amounted to more than $5.6 billion. In 2016, the city experienced another flood threat, this time 10 feet above flood level. Extensive temporary measures were put in place to protect the community from this flood – the second highest on record – which included building above-ground earth berms and walls of collapsible, wire-mesh containers filled with sand (known as HESCO barriers) on both sides of the river. This engineering feat was constructed in mere days and resulted in minimal damage to public or private property. While the majority of the community was protected from flood damage, one low-lying area of the city in the New Bohemia District was not sufficiently protected and was one of the first areas to receive permanent protection through the Cedar River Flood Control System. 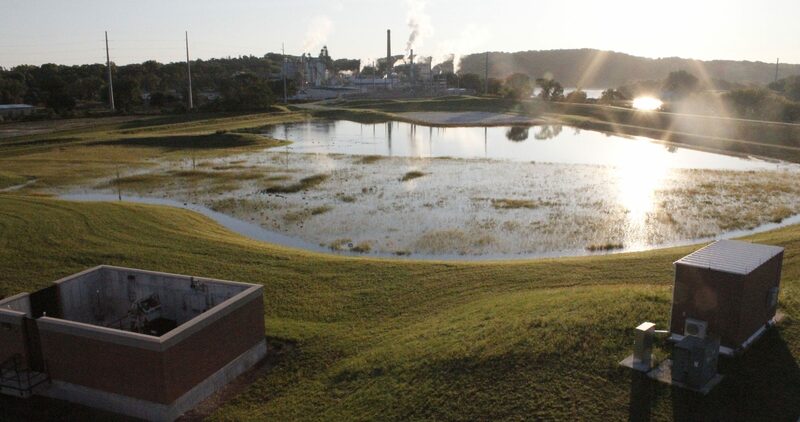 The levee, pump station, and detention basin in the New Bohemia/Sinclair District is part of a larger flood protection effort, known as the Cedar River Flood Control System (FCS). The FCS is designed to convey the same water volume as the flood of 2008, reducing flood risk through the heart of Cedar Rapids on both the west and east sides of the river. The project in the New Bohemia District includes a permanent levee structure; a gatewell which allows the City to block off the storm sewer from the Cedar River, preventing flooding through the storm sewer system; a pump station that allows water to be pumped out of the detention area to the Cedar River; a detention basin and other stormwater best management practices such as bioretention areas; and recreational amenities such as a 12’ walking trail. The City of Cedar Rapids worked in close collaboration with Stanley Consultants, HDR, and Anderson Bogert to deliver this award-winning sustainable project. Quality of Life: Atop the permanent levee structure is a new pedestrian trail that is planned to run the length of the river and provide pedestrian access throughout the new greenspace created by this project. Historical monuments will be placed along the trail, memorializing the meatpacking plant and its workers that once occupied this space, and historical markers that celebrate former City leaders will be relocated along the levee and trail. The flood control system being implemented is providing assurance to businesses that they will be protected from future flooding events, contributing to an increase in economic development in the area. Leadership: Public involvement has been a very important part of the Cedar River Flood Control System planning process and a number of public open houses were used to obtain input from residents and neighborhood organizations. A number of other meetings were held with key stakeholders, including businesses, utility providers, and government departments. The degree of stakeholder engagement contributed to a robust project, and general approval for the plan. Natural World: This project, located entirely on a previously developed area classified by the Environmental Protection Agency as a brownfield, turned otherwise unusable land into a public asset. Climate and Risk: The Cedar River Flood Control system has been designed to accommodate a 500-year flood plus an additional three feet of freeboard, which is above the standard design criteria used by the U.S. Army Corps of Engineers. A number of resiliency factors were considered in project planning and modeling processes. For example, expected hydraulic conditions were modeled with varying severities and parameters in order to account for the possibility of future severity increases brought on by climate change. The system was ultimately designed to be durable, adaptable, and to provide protection from even the most extreme flooding scenarios. NewBo Levee: Construction on the NewBo Levee began in 2016 and was completed in 2017. The levee is shown near completion during summer 2017, complete with a 12’ walking / bike trail on top.